The ethereal sounds of J.S. Epperson’s electronic music mixed with Hemi-Sync® frequencies provide an ideal vehicle for stilling and opening the mind and heart, allowing for the evolving of consciousness. The lotus grows in the murky water of still ponds and lakes. The magnificent blossom unfolds gradually in the sunlight, one petal at a time, and is seen as a metaphor for the development of the individual towards enlightenment. The ethereal sounds of J.S. 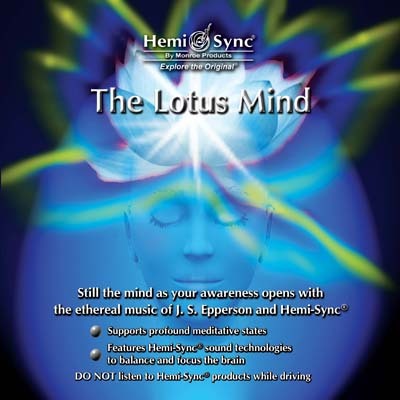 Epperson’s electronic music mixed with Hemi-Sync® frequencies provide an ideal vehicle for stilling and opening the mind and heart, allowing for the evolving of consciousness. Length: 42 minutes. Other Metamusic® titles by J.S. Epperson: Ascension, Einstein’s Dream, Hemi-Sync® in Motion, Higher, Illumination, Indigo, and Remembrance.